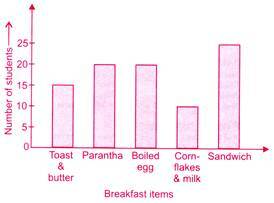 question_answer1) DIRECTION: The given bar graph show the favourite breakfast items of the students of Class V. Read the bar graph and answer the questions. Which two breakfast items are equally liked by the students? question_answer2) DIRECTION: The given bar graph show the favourite breakfast items of the students of Class V. Read the bar graph and answer the questions. How many students gave their choices? question_answer3) DIRECTION: The given bar graph show the favourite breakfast items of the students of Class V. Read the bar graph and answer the questions. How many more students like sandwich than cornflakes & milk? question_answer4) DIRECTION: The given pictograph shows the number of students of class V participated in different games at Annual Diwali Mela. Each stands for 17 students. How many students took part in the game of ring the bottle? question_answer5) DIRECTION: The given pictograph shows the number of students of class V participated in different games at Annual Diwali Mela. How many students tried the dart board? question_answer6) DIRECTION: The given pictograph shows the number of students of class V participated in different games at Annual Diwali Mela. How many more students participated in ring the prize than in estimating weight and knock the stuff toy altogether? 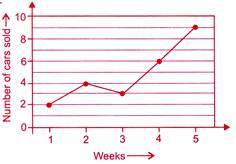 question_answer7) DIRECTION: The iine graph show the number of cars Jatin sold over the past 5 weeks. How many more cars did he sell in the last 2 weeks than in first 3 weeks? question_answer8) DIRECTION: The iine graph show the number of cars Jatin sold over the past 5 weeks. If he was paid Rs. 20000 for every car sold, how much was he paid over the past 5 weeks? 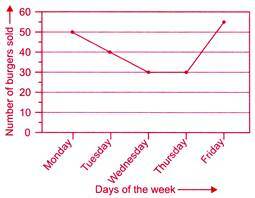 question_answer9) DIRECTION: The given pictograph shows the number of wall clocks sold by a company during a week. Each stands for 5 wall clocks. How many more wall clocks were sold on Thursday than on Tuesday? question_answer10) DIRECTION: The given pictograph shows the number of wall clocks sold by a company during a week. On what day was the sale maximum? question_answer11) DIRECTION: The given pictograph shows the number of wall clocks sold by a company during a week. How many wall clocks were sold during the week? 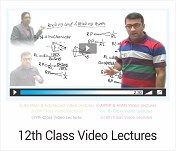 question_answer12) DIRECTION: Study the graph and answer the following questions. How many less burgers were sold on Thursday than on Monday? question_answer13) DIRECTION: Study the graph and answer the following questions. The difference between the greatest number of burgers and the least number of burgers sold is ____. question_answer14) DIRECTION: Study the graph and answer the following questions. If a profit of Rs. 15 was made for every burger sold, then how much profit was made on Tuesday? question_answer15) DIRECTION: The given bar graph shows the number of residents at 6 places. Study the graph and answer the questions. There were 4100 residents residing at _______. 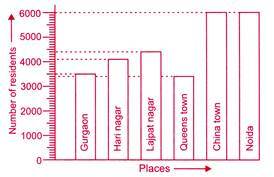 question_answer16) DIRECTION: The given bar graph shows the number of residents at 6 places. Study the graph and answer the questions. How many more residents were residing at China town than at Lajpat nagar? 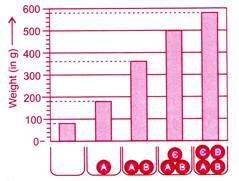 question_answer17) DIRECTION: The given bar graph shows the number of residents at 6 places. Study the graph and answer the questions. How many residents were there altogether at the 6 places? question_answer18) DIRECTION: The given bar graph I shows the number of matches played by different teams. Read the bar graph and answer the questions. Which country played maximum number of matches? question_answer19) DIRECTION: The given bar graph I shows the number of matches played by different teams. Read the bar graph and answer the questions. How many matches did India and Bangladesh play altogether? question_answer20) DIRECTION: The given bar graph I shows the number of matches played by different teams. Read the bar graph and answer the questions. 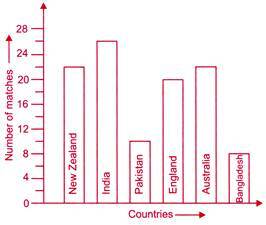 How many less matches Pakistan played than Australia? 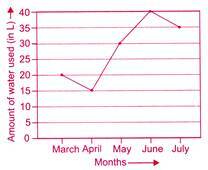 question_answer21) The line graph shows the amount of water used by Jamie from March to July. Express the amount of water used in June as a fraction of the total amount of water used. question_answer22) Four balls A, B, C and D are placed inside a container, one after another. The bar graph shows the weight of the container when empty and when different balls are placed in it. Which ball is the heaviest? 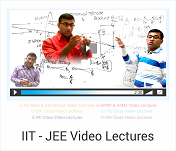 question_answer23) The bar graph shows the amount of money Shreya and Meena saved from March to July. Who saved more and by how much during 5 months? question_answer24) The table shows the number of pupils in five primary classes. Each pupil donated Rs. 10 to the foundation for the elderly. How much did they donate altogether? 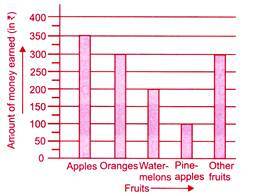 question_answer25) The bar graph shows the amount of money Varun earned in a week by selling fruits in his store. If he earned 20 paise for every orange sold, how many oranges did he sell?